FLAGSTAFF, Ariz. -- People across northern Arizona couldn't use the Internet, their cellphones or landlines for several hours Wednesday after someone vandalized a fiber-optic line that brings communications to a large part of the state, officials said. Businesses couldn't process credit card transactions, ATMs didn't function, law enforcement databases were unavailable, and even weather reports were affected in an area stretching from north of Phoenix to Flagstaff, about 100 miles away. CenturyLink spokesman Alex Juarez said the problem was first reported around noon Wednesday. Internet and phone service started to come back to some residents and businesses in Flagstaff by 6:30 p.m. He said in an email sent shortly after 3 a.m. MST Thursday that "all services in North Phoenix and Northern Arizona, lost due to vandalism, have been restored." There was no estimate available on how many people were affected. Phoenix police said CenturyLink employees found that the fiber-optic cable in far north Phoenix had been completely cut through. Police were investigating the incident. The cable, which CenturyLink owns, is near a riverbed in an area that isn't accessible to vehicles. It carries signals for various cellphone, television and Internet providers that serve northern Arizona. According to Juarez, technicians from Monroe, Louisiana-based CenturyLink had to go through a long, tedious process of inspecting the line "mile by mile." Meanwhile, Flagstaff's 69,000 residents tried to go about their daily business. Zak Holland, who works at a computer store at Northern Arizona University, said distraught students were nearly in tears when he said nothing could be done to restore their Internet connection. "It was kind of a slap in the face if the Internet goes down," Holland said. "It just goes to show how dependent we are on the Internet when it disappears." Many students told Holland they needed to get online to finish school assignments. University spokesman Tom Bauer said it was up to individual professors on how to handle potentially late assignments. In Prescott, businesses were open and trading on the famous "Whiskey Row." Residents told CBS 5 News-KPHO that being hurled 25 years into the technological past was really just a an inconvenience. "No one's phones work, their internet's down, none of our computers work, ATMs are down," said a bartender at the Whiskey Row Pub, where transactions were being conducted in cash-only. Kate Hance and Jessie Hutchison stopped at a Wells Fargo ATM to get cash because an ice cream shop couldn't take credit cards without a data connection. They left empty-handed because the outage also put cash machines out of service. "It's moderately annoying, but it's not going to ruin my day," Hutchison said. Staff at Bookmans Entertainment Exchange in Flagstaff said they tried for about 45 minutes to restore their Internet connection before employees realized their equipment wasn't the problem. People often go to the popular bookstore and cafe to do homework, listen to music, watch movies and browse jobs online. Some set down their computers Wednesday only to walk out minutes later after learning Internet service was down. Staff suggested to kids bewildered by the technical problem that they should read a book. Cordell Charley just finished some online banking when the outage happened and shut off his computer to grab lunch. "You just feel lost," he said. "It's like, what happened?" 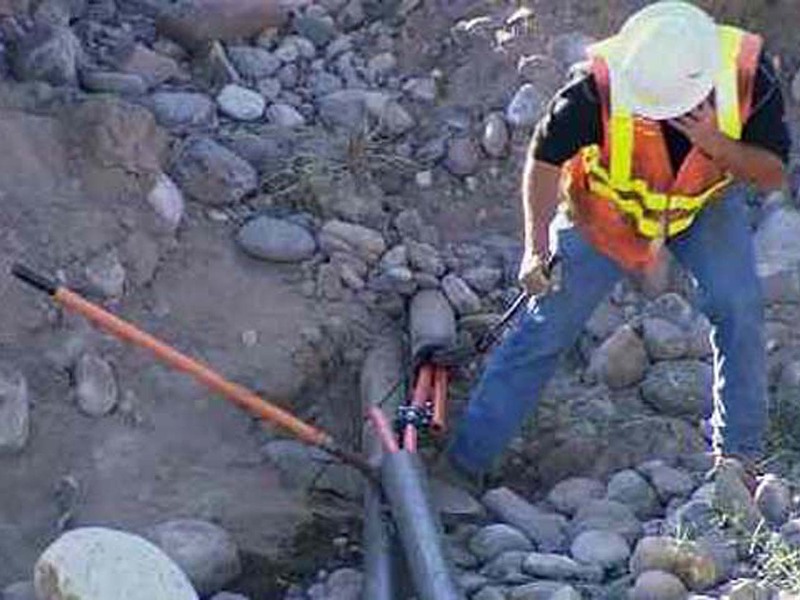 Mark Goldstein, secretary for the Arizona Telecommunications and Information Council, said CenturyLink's cable likely has bundles of fibers that can be leased to multiple service providers. If the line follows only one direction with no alternative paths to reroute service, then any damage to the line will wreak havoc. At Flagstaff City Hall, employees were unable make or receive calls at their desks. "It's quieter than usual," said Stephanie Smith, assistant to the city manager. "The good thing is there is still lots of work to get done even without phones ringing." The city was relying on the Arizona Department of Public Safety to assist with dispatching police and fire services. In Prescott Valley, about 75 miles north of Phoenix, authorities said 911 service was being supplemented with hand-held radios and alternate phone numbers. Water and sewer facilities switched to manual operations, and residents needed cash to make utility and court payments. Yavapai County spokesman Dwight D'Evelyn said 911 lines were limited Wednesday afternoon and authorities couldn't access law enforcement databases. Weather reports from the region weren't able to reach anyone. During their evening newscasts, Phoenix television stations showed blank spaces on their weather maps where local temperatures would normally appear.